Remember the date folks – today is the day Apple (and Firemint) changed the video gaming world. In a video posted to the company’s blog, Firemint has showed off a new update that is coming to its popular iPad game, Real Racing 2 HD. Said update brings the ability to take the Digital AV cable, plug it into your shiny new iPad 2, and play take your racing to the big screen. And we’re not talking boring old mirroring here either. 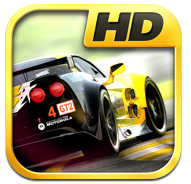 The video shows Real Racing 2 HD running on a large TV in glorious 1080p, with the iPad screen showing a different game UI. It. Looks. Gorgeous. No word yet on a release date for the update, but if this is where iPad gaming is going, sign me up! Oh, and imagine this running over AirPlay instead of a cable. Blown your mind, right? Mine too.